Sometimes the homily almost writes itself. Sometimes my wife, Jan, helps. I found out this week that someone was telling lies about me. It wasn’t a huge surprise because I’ve known this person for a long time and I know he does it to other people. In this particular case it was a pretty big lie It wasn’t a lie of the little and white variety. My first reaction was to get even. He can’t get away with this! I’ll make him pay. I might even sue. I could, y’know. Defamation of character is a serious thing. But then my lovely bride, who often takes delight in spoiling my fun, said “Have you read this Sunday’s Gospel?” Yes, I had read it. Like Jesus says, anyone can love someone who loves them. It’s no big deal. Every kid loves his or her mother. Every husband loves his wife, or at least he should. Maybe we should say most husbands love their wives. If you’re a married couple and you love each other, congratulations! That’s a wonderful thing. But it’s not that unusual. Sometimes it’s hard, but it’s not unusual. What Jesus is asking us to do today in the Gospel is a lot harder. In fact, for some people it’s impossible. Love your enemy. Return love for hate; good for evil. C’mon Jesus, we’re not made that way. We have the instinct for self-preservation. Staying away from people who might harm us is a good way to stay healthy, even to stay alive. Fight or flight. Kill or be killed. An eye for an eye. Let me say something about that last one. The expression “an eye for an eye comes from the Jewish Torah, our Old Testament. It didn’t mean that if someone put out your eye you should rush out and retaliate. It’s actually a restriction. If you must avenge yourself for the loss of an eye, you have no right to take more than an eye from the other person. Don’t take two eyes. Don’t kill him. Do no more harm to him than he did to you. It’s a principal that our modern-day legal system seems to have forgotten. Remember in last week’s Gospel Jesus told us that He didn’t come to abolish the law, but to fulfill it. He said that anyone who breaks even the least of the commandments will be called the least in the kingdom of heaven. There’s the retaliation that we humans want so badly. That guy who’s lying about me will suffer the consequences of his actions. It’s for God to handle. If I lash out at him, I’m going to have to suffer the consequences, too. Am I going to say something to him. You bet I am. Jesus told us how to handle conflict in Matthew’s Gospel. First you talk to the other person. If that doesn’t work, take one or two others along with you. If the person still refuses to cooperate, tell the church. The last resort is to “treat him as you would a Gentile or a tax collector. Notice that punching the other guy in the nose isn’t mentioned anywhere in either the Old or New Testament. What I’m saying to you is this. We live in a world where there’s a lot of conflict. Many of our brothers and sisters are selfish and self-absorbed. They’re quick to blame others and very slow to take responsibility for their own actions. When you have to deal with someone like that, it’s easy to fall into the trap of treating them the same way. But what does scripture say? “Do unto others as you would have them do unto you.” Even if they’re already done something bad unto you. Remember that I said this is impossible for some people. I may have been wrong. It may be impossible for all of us. We’re human. I know I struggle with it. In fact, let me make a general statement here. Each of us is different in many ways, but we’re also the same in many ways. I’ve been called as a deacon to deliver God’s message. But when it comes to sin, you and I are exactly the same. As much as I’d like to stand up here and tell you that I practice everything I preach, it would be a lie. Jesus was the last preacher who could say that with a straight face. I struggle with sin every day but hopefully, I can use my own struggles as a tool to help you. Then confront your enemy, accompanied by the Holy Spirit. Make your case in a calm, peaceful way and you may be surprised by the results. But whether the confrontation turns out well or badly, you won’t have let the other person to cause you to sin. With God’s help, you can find peace and still be the bigger person. Jesus makes two points in today’s Gospel. First He talks about salt. Salt that’s lost its flavor is good for nothing except to be thrown out and trampled underfoot. We know all about that, don’t we? I don’t know about you, but I’ve trampled on more salt this winter than I ever wanted to. I’d be more than happy if I never trampled on salt again…..at least for this year. Since we’re all tired of salt let’s look at His second point. “You are the light of the world.” Don’t hide your light under a bushel basket. This is one of the many things that Jesus said that have become part of our everyday language. Even an atheist can understand that you wouldn’t hide a light under a basket. Light is meant to be seen and to be shared. When I was ordained, each of my kids gave me one of the four volumes of the Liturgy of the Hours, our daily prayer book, and each of them wrote something in their book. In her volume, my daughter wrote “remember that a candle loses nothing by lighting another candle.” What a profound statement! My former spiritual director, the late Monsignor Edward Eichor used to tell a story about a mass that he attended at the old Arena on Oakland Avenue. The building was totally dark. Someone struck one match and lit one candle. That candle was used to light the candles of the people nearby. They lit others and soon there were thousands of candles burning brightly, lighting up the whole place. All that light and the original candle was still burning as brightly as it had to begin with. That’s what Jesus calls us to do with our light. As I’m learning about this beautiful church, I can’t help but be impressed by all the amazing statues depicting saints, especially Bohemian saints, who have lived inspirational lives. Of course we have our Beloved Savior and His mother and father, Mary and Joseph. We’re all familiar with their lives of virtue and holiness. Above the altar we have our patron, Saint John of Nepomuk. John is depicted holding his fingers in front of his mouth in the traditional “shhh” sign. John is the patron of the seal of the confessional. As most of you know, the legend is that John refused to reveal details of the Queen’s confession to her husband, the King. John’s faithfulness to his priestly vows ultimately led to his death. What about Saint Elizabeth of Hungary? She was the daughter of a king, but rather than live a life of luxury, she built hospitals and worked in them herself, dressing the wounds of the sick. She only lived twenty-four years, but she took Isaiah’s words in our first reading to heart. When Elizabeth’s husband died, she became one of the poor herself. But, nearly 800 years after her death, her light continues to shine. Remember how the song goes. Wenceslaus was sitting in his warm castle, looking out the window when he saw a poor man gathering firewood. He called his page and the two of them went out into the cold. They took food and firewood to the poor man. The page didn’t think he could make it, but Wenceslaus told him to follow in his footsteps, which he did, adding yet another phrase to the language. Wenceslaus’ brother was a pagan like his mom and in 938 AD, he killed the good king, making him a martyr for the faith. 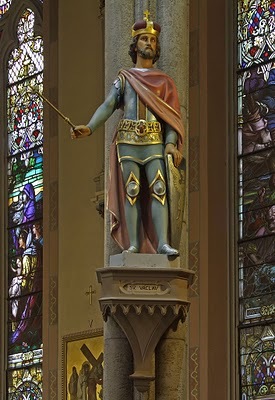 Don’t panic, I’m not going to talk about every saint represented by a statue in our church. We’d be here a long time if I did. My point is that every saint is different. Each one lived a life of heroic virtue in his or her own way. Some were rich, some were poor. Some were highly educated, some had no formal education at all. God created each of them to perform a job here on earth and they all came through with flying colors. Some of our saints were saintly almost from birth. Some had a conversion at some point in their lives. Remember, Saint Paul, the man from whom we learn so much about our faith, was a murderer before Jesus knocked him off his horse. He was even responsible for the stoning death of our first deacon, Saint Stephen. Saint Augustine, one of the great scholars and teachers of the faith was a terrible sinner until his conversion, which was the answer to his mother, Saint Monica’s constant prayers. We have statues, and icons, and paintings of the saints to inspire us to live saintly lives. But God doesn’t intend for us to mimic them. There’s already been a Saint Wenceslaus. If you or I try to be him, we’ll just be a second rate imitation. A copy is never as good as the original. Do we really need another “Hawaii 5-0”? Or another “Dallas”? The point is that God wants to see OUR light. You may not be a king, or a queen, or a great scholar, or have the money to open a hospital. God created you and me to be the best version of ourselves that we can be. If you’re a parent, He wants you to be the best parent you can be. If you’re a husband or wife, He wants you to be the best spouse you can be. God has given us the saints as inspiration, but not as blueprints. See, if we hold up these men and women on too high a pedestal, we may think we can never measure up. But notice that Jesus didn’t say “let your light shine, but only if it shines a certain way.” He calls us to let our particular light shine in our particular way, making it the brightest it can possibly be. Remember the story I told you before. One tiny match lit one tiny candle which shared its light with its neighbors eventually lighting up an entire arena. Work each day to be the best, the brightest, version of yourself, and only God knows what you can accomplish with His help.